Mrs. 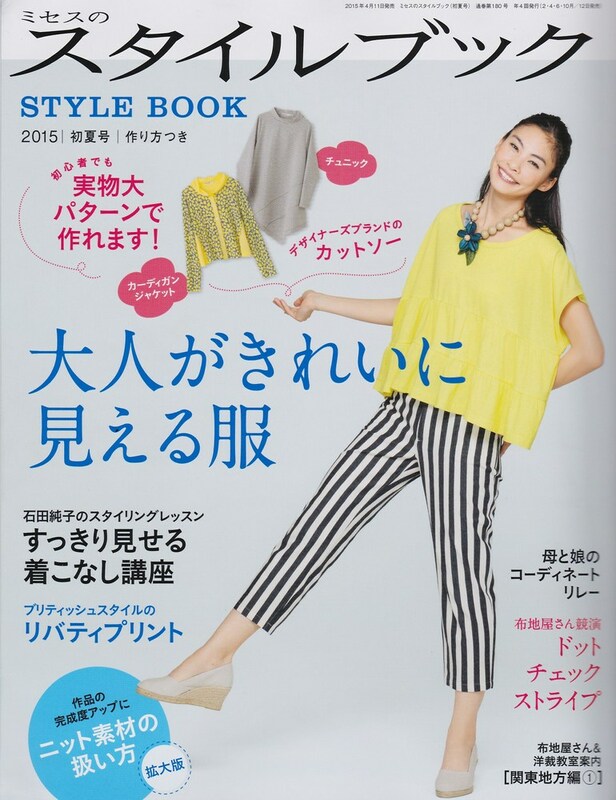 Style Book 2015 P. 187 self-drafted top is complete! I'm showing it worn here under the Yoshiko Tsukiori's Pattern N, 'Happy Homemade Sew Chic' cardi along with one of my newlook 6192 skirts. As you may recall, I was recently gifted with this wonderful publication that is unavailable in the United States. At least in any part of the U.S. that I am aware of, and so desperately wanting to make something from this book chose the cute yellow top on the cover. All patterns are self-drafted with this particular top drafted from rectangles, felt this pattern might be manageable for my skill level. More views of the same top shown on both younger and older models. As I fall into the 'older' model category thought this would be appropriate for me, even though it has a younger vibe to it. The older model shows it worn with a sweater and a cardi/jacket. This is all I had to go on. Everything is written in Japanese. Loving math, I dug in with great joy to create my master pattern. A math puzzle to me! It wasn't until this moment I realized I had no metric system measurement tool other than my old wooden yardstick. It worked fine. Can't remember if I've shared my 'tracing paper' with you before..... but pellon 830 Easy Pattern Interfacing - Tracing Cloths is my go-to- tracing paper now. Joann's is the only retailer that stocks this product locally, so the last time I was there I bought the whole bolt. At $2.49 with a 50% off coupon the cost was quite reasonable. I love this stuff! You can write on it (though pencil does not erase well.... at all), cut it, iron it, and the big winner in my book is that it sort of 'sticks' to your fabric for cutting ease. 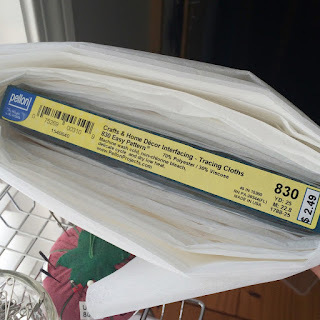 Even the slippy slidey, liquidy fabrics are easier to cut using this product as your master pattern as your fabric doesn't move around during the cutting out process. Anyway, in the photo below I was beginning to form my pattern. 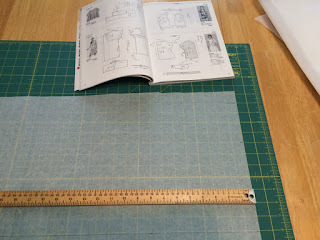 My new large-size cutting mat made this sooooo much easier as it is prepared for fabrics to sort of 'stick' to it and the grid made making rectangles easy. I'd bought this mat for cutting fabrics for quilts, but it's cost-effective for garment sewing too. 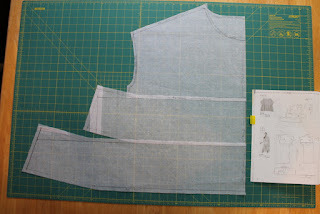 The neckline was drawn free-hand and I was a little concerned it might be too little or too big, but figured I'd handle any needed alterations during the construction process. These are both the front and the back pieces. 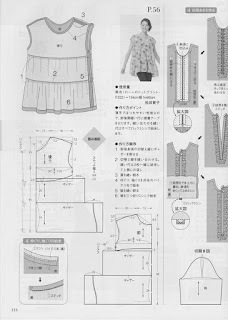 You trace the different necklines on your fabric for the front and back bodice, then cut 2 each of the middle and bottom ruffle. The straight edge is placed on your fabric's fold. 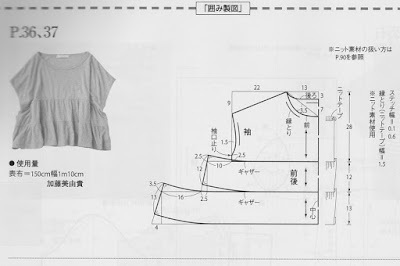 Let's see how my pattern pieces compare to the line drawing. Not bad. Thought I'd put these two different top drawings up side by side to show what I used during the construction process. The photo, bottom right, is of a very straight, billowing top.... not at all what I desired.... but the basic idea is the same as the top I wanted. See how my top, photo left, sort of hangs down... not billows out straight.... due to the middle and bottom ruffle slanting upward, not cut straight. Anyway, this diagram helped me think through the construction steps. And here's the finished top. The soft, drapey gray knit was a perfect choice for the desired effect of this top. In the photos above and below, I've paired it with the (now blogged!) 4-panel Alabama Chanin skirt, unembroidered with the exception of faux flat-felling all seams by hand-stitching with 3-strands of matching gray embroidery thread. Side views. Hmmmm, these made me unsure if I thought this little top would complement my shape on its own. 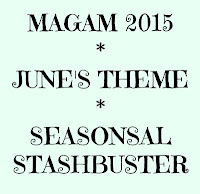 The gray t-shirt jersey fabric 4-panel AC skirt, with the faux flat-fell hand-stitched seams, coupled with the gray knit fabric from my stash for this top completes my Make a Garment a Month Challenge for both May and June 2015. Upon closer look you can see that I hand-stitched the neckline with the same 3-strand embroidery thread that I faux flat-felled the seams on the AC skirt, but in the herringbone stitch, as that is a 'stretch' stitch. I tried to finish the neckline with a bias strip as per the pattern's line drawing, but that is a skill I just have not mastered on knit. As a plus, this neckline finish helps the top coordinate with the AC skirt, and with the Tsukiori cardi/jacket whose neckline is finished the same. And by the way, the size of the neckline turned out perfect! Sort of scrunched here to look like the magazine photo. What the top truly looks like, below. The sleeve hems were finished by turning under 3/8" and topstitching with twin needle. Even then it 'tunneled' a little, but felt I could live with it. ....and tops of skirts in the front, photo below. 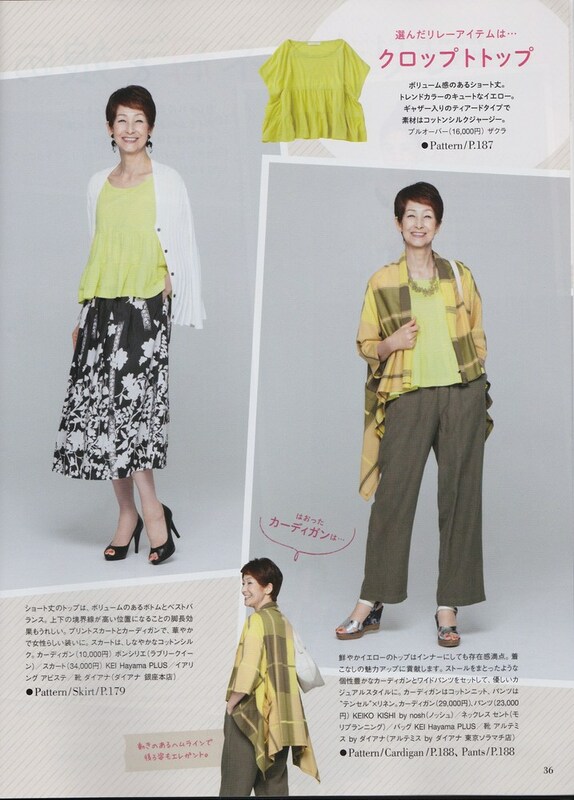 Here is another newlook 6192 skirt with the same cardi/jacket. What's a nice plus is that this color slips into my existing wardrobe well. Thank you sweet friend for my wonderful gift! I'll be writing the Alabama Chanin 4-panel skirt information soon. Happy Sewing Everyone! Your top turned out wonderful, and looks fantastic with both skirts. Great job and thank you for the information about tracing on pellon 830 interfacing. Going to Hobby Lobby later will check to see if they carry it, if so I'll be buying. 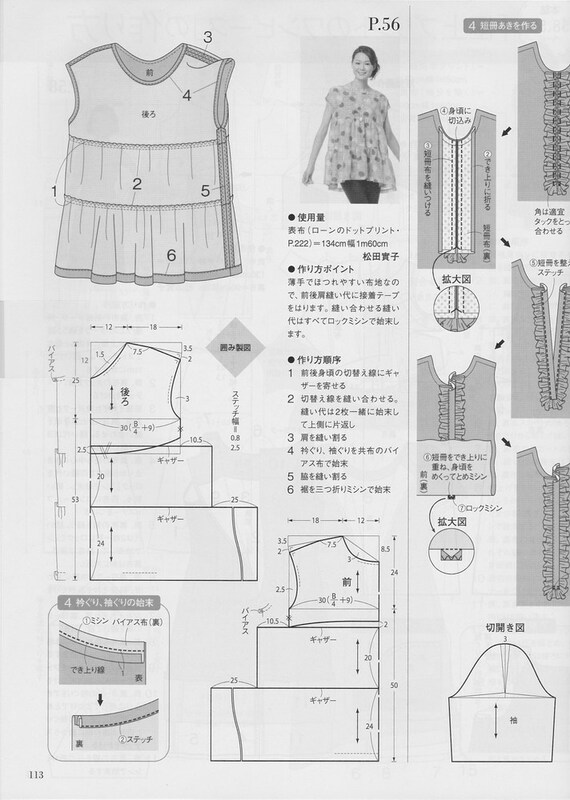 I have a Japanese pattern book that I bought 2 years ago, and its all in Japanese even the title, and has so many cute tops...but seems so daunting, but one day. Thank you so much! 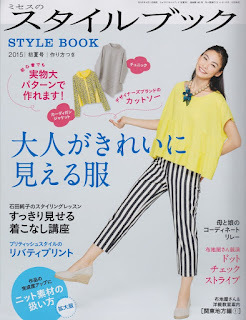 At first Japanese books seemed a little daunting to me too, but once I dipped my toes in, I am hooked! Love the detailed illustrations and the way they show step-by-step construction process of the garment. You'll have fun! Gorgeous top! I love how your photo of the top layed out flat shows how much volume there is, but the style and the fabric relax into such a graceful shape when worn. 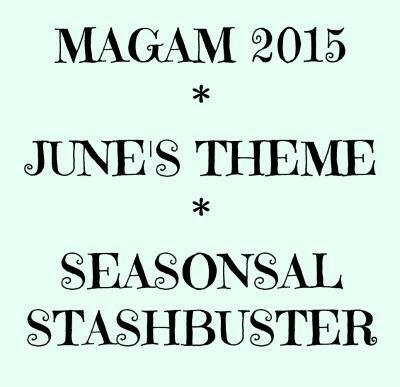 It looks terrific on you! Thank you Nancy! And thank you for bringing that subject up as one would think it'd be unable to be worn under a cardi/jacket due to the extra volume.... but the Tsukiori cardi/jacket has armholes that accommodate this top well underneath with no visible bulges or lumps. I absolutely love the look of that new top paired with the cardi/jacket! I never would have dreamed of putting them together (maybe because I would look like a shapeless munchkin in them! ), but they are stunning on you. You don't give yourself enough credit for the accomplished seamstress you've become. Thank you so much Mama Pea! It was sort of out of desperation because I was feeling that the top might not work on its own, and I wanted to enjoy wearing it. Cardi/jacket to the rescue! That really looks like fun! And sounds like you actually had a lot of fun! The T-Shirt turned out very pretty and I think it looks flattering on you! Also I am very impressed by your hand stitches! The whole process was a lot of fun from drafting to sewing! Thank you so much! This was such an interesting read. Good to see the interfacing in action, I remember you had mentioned it before. And there's another slightly similar pattern in the same book! 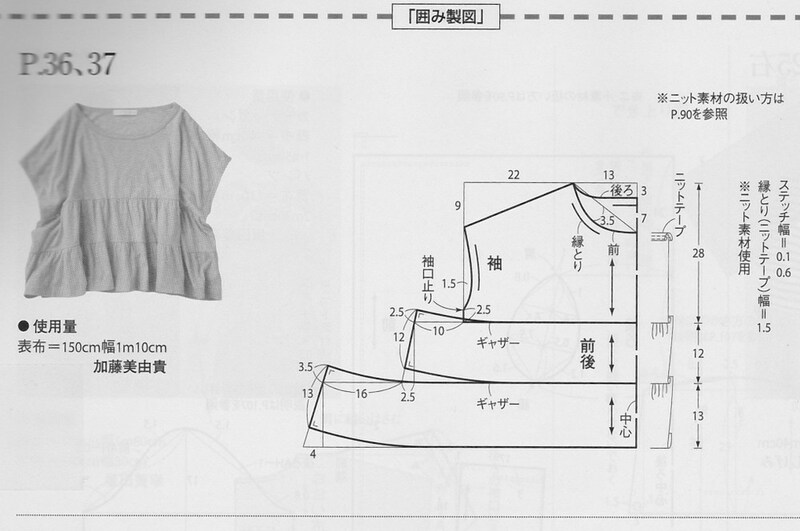 I wonder if it wasdiffult to sew the gathered seam in knit jersey. You did it so beautifully! And you look great in it! This rather voluminous style top is one of my fave silhouettes, but it does take some getting used to, doesn't it? Good question..... the gathering was a little tricky, particularly with the soft, drapey knit.... and seemed to take f-o-r-e-v-e-r! Not too hard, just had to stick with it. What's so funny is that I think I wrote a post back in May claiming to not be a 'ruffle' person..... and this top is all about 'ruffles'! Well, I love this one! Thank you Erin! The book looks very interesting, I will put on my wish list :) I enjoyed all the details and your top turned out great. I agree that gathering soft knit is not an easy job. All the patterns in the book are so pretty, it was hard to know which one to choose.... so I chose the only one I knew I could draft. :) You'll have no problem with any of them! Thank you Hana! This is absolutely beautiful Lisa! I really love it. I think the shape and style are totally gorgeous, and must be perfect in the summery weather you're having. I like it so much maybe I think I need to copy this top too! I love the cardi... Just pefect with that top.. Love the outfit.. Happy sewing. This cardi has grabbed my attention! It's gorgeous.